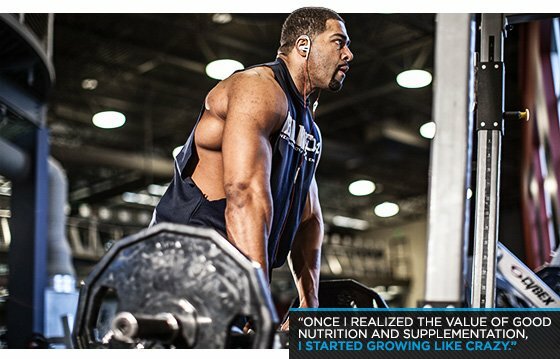 David Otunga needs 250 grams of protein each day. Without some help from supplementation, he’d spend his entire day eating! Check out his full supp stack. When you're as busy as David Otunga, there's no way you have time to sit down and eat a complete meal every few hours. There's also no way you can hope to down 250 grams of protein each day by just eating chicken breasts. You need a little help from smartly selected supplements. Supplementation is a huge part of nutrition. It's not always easy to get all the vitamins and minerals or hit your macros with food alone. That's where supps come in. "I need at least one gram of protein per pound of bodyweight. That's about 250 grams of protein each day." Because he's on the move and busy, David relies on powder to make sure he gets the protein he needs. "A protein shake will keep your metabolism going, it'll help you build muscle, and help you fight fat." BCAAs are another important part of David's supplement plan. "You can get BCAAs through eating steak. But how much of that can one person eat? I get BCAAs in powder form and mix them in my shakes." David also explains that multivitamins and fish oil are important parts of anyone's diet. "Everyone should take a multi. I just started taking them a few years ago and I can tell they're helping." "For guys just getting started in the gym, I can't stress how important supplements are," David says. "When I first started working out, I grew, but once I realized the value of good nutrition and supplementation, I started growing like crazy." For guys interested in growth, he recommends taking protein, BCAAs, and creatine. "If you're looking to get big, creatine will help." Before he offers advice to people, David stresses research. Depending on your goal, you should try to find out what will help you get there. "Learn about your goal. Find out what other people are doing and learn from them. Find out how they're training, how they're eating, and what they're using as supplements. Always do your research. That's the best answer I can give." "The WWE is under WADA Olympic drug guidelines, which ban even common over-the-counter supplements," David says. "So, I err on the side of caution."